Nicola DiCamillo first appears in the Painesville, Ohio, area between 1906 to 1918. Nicola DiCamillo was born on February 3, 1876, at Collecorvino, Italy. He married Giovannina DePietro sometime before 1918. Nicola DiCamillo immigrated to the United States on May 27, 1906, at age 30. He was travelling to Ashtabula, Ashtabula County, Ohio. He was joining his cousin, Camillo DiClaudio (probably Claudio DiCamillo). 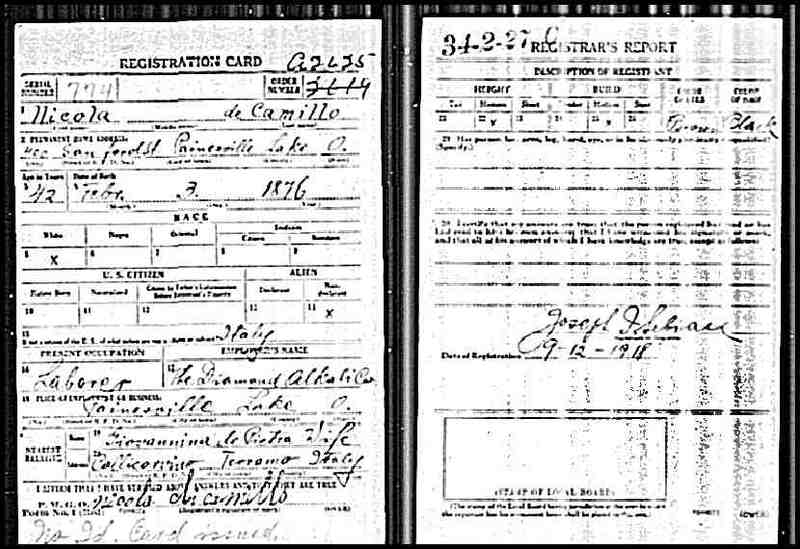 Nicola DiCamillo registered for the World War I Draft on September 12, 1918. He was living at 400 Sanford Street, Painesville, Lake County, Ohio. Nicola was employed by the Diamond Alkali Company. His wife was living in Italy. Nicola was probably a cousin of Painesville Italians Achille DiCamillo and Sabatino DiCamillo.